with Jewish people ultimately controlling the world”. will tend to associate legitimate discussion as “extremist” speech. groups could be associated with a supposedly “extremist” ideology. 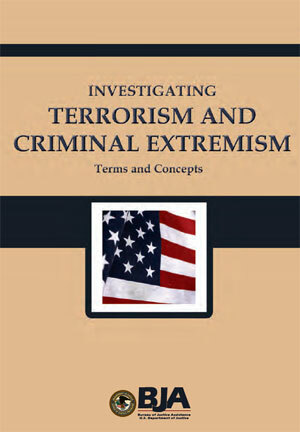 To see the full list read the U.S. Department of Justice Terrorism and Criminal Extremism Terms 2005-2009.
satirical reference to conspiracy-related beliefs. meeting a defined tactical or strategic intelligence goal. Concentration Camps: Detention camps supposedly being built or already built by the United States government, according to conspiracy theorists. Flag of Peace: The American flag preferred by the “patriot” movement; a red, white, and blue flag without any gold trim, braid, balls, tassels, eagles, fringe, or spear on the flag or pole. denotes military jurisdiction. Only under the “flag of peace” do U.S.
citizens receive their constitutional rights and due process. utilizing other military vehicles and gear. of legal restrictions to access by anyone who seeks that information. of pirate stations adhere to right-wing or antigovernment philosophies. time cards, or to forms—of the phrase “UCC 1-207,” or variants thereof. preamble citizens, common law citizens, or other appellations. they had no tax obligation. democratic-industrial regions of the world, thus the term “trilateral”). determined to promote a one-world government.